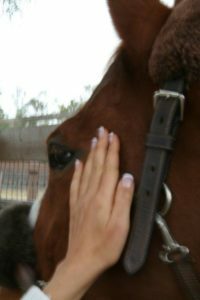 The approach is key when working with horses and acupressure. Horses appreciate being given control of the session: in other words, being allowed to say “yes” or “no” to the session as well as determining the way the session will unfold. We will always honor the horses’ wishes. After we finish the session, we always thank the horse for participation in the session, and see if they have any insight for us to discuss with their owner or trainer.